This decadent Christmas Day brunch is definitely one for seafood fans. Chef de cuisine of Ossiano Grégoire Berger was recently named the 10th best chef in the world, at the international Best Chef Awards and Seafood Speciality Chef of the Year at The Pro Chef Middle East Awards. Chef Gregoire’s eight-course ‘Spherification’ festive menu will feature a range of dishes including Gillardeau oysters, foie gras “terrine”, lobster and black truffle and the chef’s signature dish, the rainbow trout “Floating Island”. Salha and the Million Dollar Band will provide live entertainment all evening long. The restaurant is perfect for an extra-special Christmas – it’s entirely underwater and has incredible views through to the Ambassador Lagoon. The popular Argentinian meat restaurant will be hosting an a la carte brunch on 25th December. Diners can pick from a delicious four-course festive menu. Mains include rib-eye steak, a rack of lamb, sea break fillet – or of course – turkey. All mains are served with traditional festive trimmings, including Brussels sprouts, carrots, parsnips, beef bacon wrapped sausages, cranberry sauce and homemade Yorkshire pudding. On Christmas Day Park Hyatt Dubai will be serving up an incredible festive feast on the hotel’s beautiful piazza, with views over Dubai creek and the marina. There will be live cooking stations and chefs on hand to rustle up all of your favourite dishes, along with free-flowing bubbly. Popular dishes include pan fried foie gras with apples and calvados, pan fried scallops with black truffle, along with plenty of meats including lamb, quail, pigeon and duck. There’s also plenty available for seafood fans and vegetarians. For dessert, guests can tuck into a number of specialties in the dedicated dessert room. There will be live music from a saxophonist and DJ, whilst the youngest guests will receive a surprise gift from Santa Claus. If you’re looking for a traditional British Christmas meal, Gordon Ramsay’s restaurant at Atlantis The Palm is a great place to head to. Diners can tuck into roast turkey and all the trimmings, vegetarian Wellington, a wide range of hot and cold starters, a cheese and bread station and a seafood station. For dessert, there’s a traditional British Eton mess and an eggnog panna cotta. There will be a singer performing festive hits throughout the brunch, and children’s brunch pass comes with free access to the Lost Chambers aquarium. 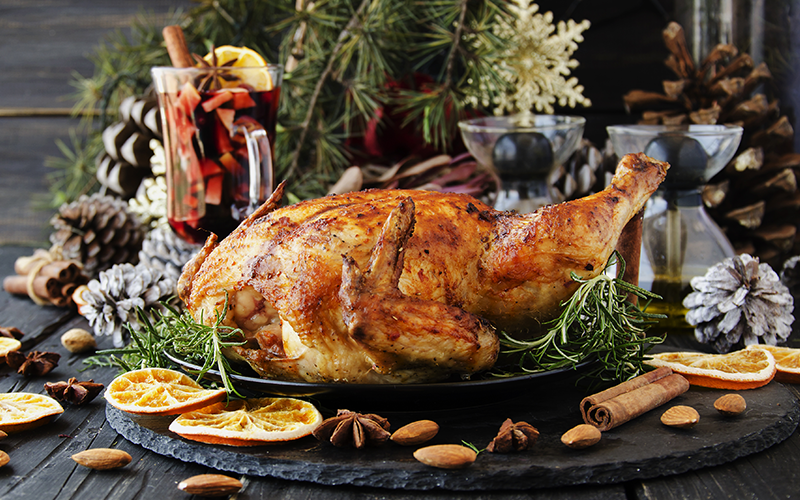 Throughout the afternoon on Christmas Day, Aji will be offering turkey and all the trimmings for just AED 250 per person. Don’t fancy dining during the day? From 8pm until close, the restaurant will be offering three free drinks to everyone who visits the restaurant in their festive best, along with a 30% discount on dinner bookings for women. This year West 14th will be serving up a Christmas Day BBQ. Guests can enjoy a selection of salads followed by BBQ Christmas turkey, with or without stuffing, skewers, and lamb roast. For those with a sweet tooth, there’s also a tempting selection of festive desserts. And there will be a free mocktail or glass of bubbly as a special Christmas welcome to you from DUKES Dubai. The wanderlust brunch includes live cooking stations with cuisines from all over the world. For 25th December there will be a festive twist on the menu (diners can expect popular Christmas favourites such as turkey and trimmings). In total, there will be 11 live food stations, with 360 dishes from all over the world. If you fancy getting out of the city for 25th December this is the brunch for you. The family friendly restaurant will be offering a festive buffet brunch from 1pm-4pm on Christmas Day. There will also be plenty of kids’ activities to keep the youngest members of the family entertained. Children can enjoy flying kites, face painting, pony and camel rides. There will also be jugglers and a magician’s performance. And – of course – Santa Claus will be on hand to chat to his fans during the brunch and will distribute presents to all the young guests. While children enjoy their time in the kids’ outdoor area, adults can enjoy the live band, and Christmas carols performed at the al fresco terrace overlooking the gardens and the golden desert of Dubai. The Urban Picnic brunch will be serving up festive favourites on 25th December. Spend the afternoon relaxing by the pool in one of the many cabanas and fill up your picnic basket with your favourite festive dishes at the live grill and indoor buffet.